So the finalists gathered on a wintery morning yesterday to compete for bragging rights and a £1000 cash prize. There was an air of excitement in the lodge as the competitors went about their rituals and routines to prepare for the day’s fishing. There was the usual banter but also the occasional studied silence as each angler considered their tactics for the day – after all, this was serious wasn’t it? It was proper cold as the morning sun hadn’t yet warmed us up as we did the peg draw – always a key moment. After a few rules were clarified (and one or two anglers read the rules for the first time!) it was time for each angler to head off to their starting peg and await the buzzer to signal they may fish. As the day progressed it was clear the lakes were producing well and by lunch time there were 9 anglers who had caught the maximum number of fish for that point in the day – so it was all to play for. After a warming lunch of Venison stew and a well done crumble it was back to business. The competition is based on catching a fish on each peg and so even the front runners had to maintain their form or risk falling behind. There were two sessions in the afternoon and 7 anglers caught on the first session so it really was going down to the wire – but only one angler caught his last fish! And that was right in the last few minutes of the session – there was quite a cheer. So I am happy to announce that Robbie Maunder of Radstock was the victor catching on all six pegs with a total bag of 21lb exactly. 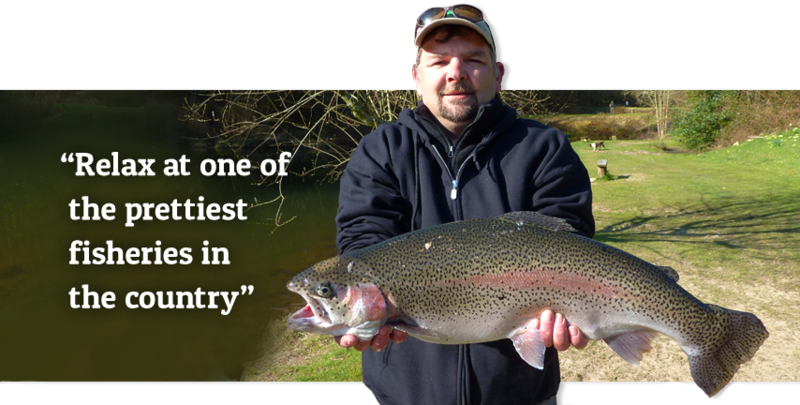 Robbie has fished many of our competitions over the years and it was good to see his efforts being rewarded finally. This is the third year in a row that we have seen the prize head out of the county and a cheeky comment that I heard went something along the lines of “do you want us to arrange some lessons for the Devon boys Chris?” So if you are reading this and you fish and are from Devon I would call that a challenge to your man or woman hood – wouldn’t you? A total of 60 fish were caught which is one of the best competition days sport we have seen and just goes to show it is worth coming out in the colder weather.